What’s not to love about sushi? It’s healthy, inexpensive and delicious. Yet, as this cuisine continues to expand world-wide there are increasing concerns about over-fishing. The bluefin tuna lies at the heart of the sushi cuisine as the most prized fish. Therefore, the fact that tuna is one of the world’s top three most overfished species, will not come as a surprise to you. The bluefin tuna is an endangered species, their biomass is believed to have decreased to a staggering 4% of it’s former population. 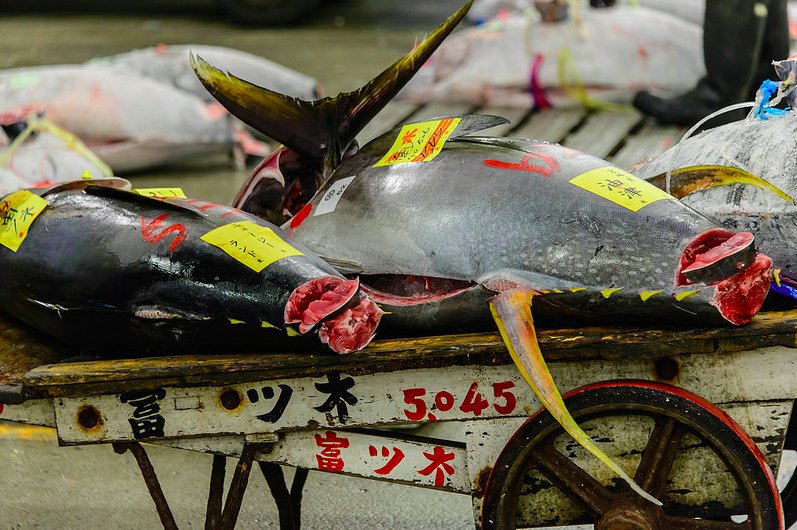 This depletion in numbers has only increased the demand and price for bluefin tuna, 80% of which are sold in Japan. 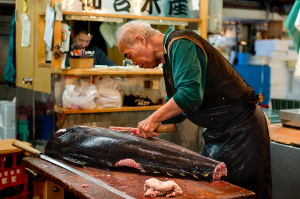 Indeed in 2013 a Japanese sushi restaurant owner, Kiyoshi Kimura, paid a record-breaking $1.76 million for a 222 kilogram bluefin tuna at Tsukiji fish market. Why is the tuna such a special fish? Alongside other ‘most-fished’ species such as pollock and anchovy, tuna differs in that it is a relatively large fish. 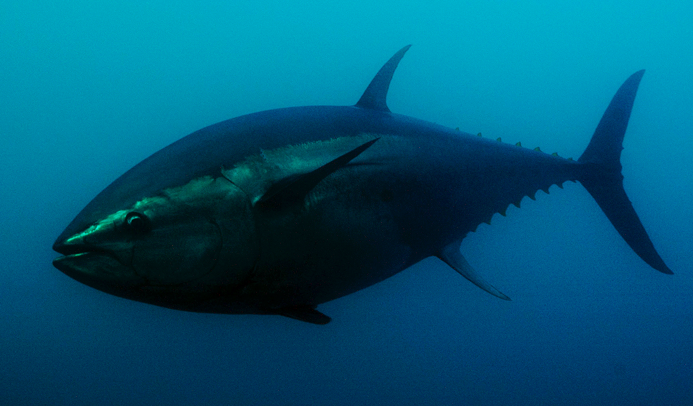 Able to reach up to 3 meters in length and 450 kilograms in weight, tuna are a vital predator in their pelagic food chain. The rapid depletion of their population greatly disrupting the balance of their marine ecosystem. Their torpedo shaped bodies enable them to reach speeds of up to 72.5 km per hour, allowing them huge migration capacity. Tuna migrate for the primary purposes of searching for food and spawning. They are one of the few warm-blooded fish, due to their well-developed circulatory system. They need to swim continuously in order to stay metabolically active, allowing their circulatory system to maintain internal body temperature above the sea waters. These expansive migratory habits make conversation efforts difficult to accomplish. The major problem in the overfishing of tuna lies in their size. Bluefin tuna are believed to be able to live up to 50 years, thus taking much longer to mature than smaller fish. The majority of wild tuna are caught between 1 to 2 years of age, before they reach maturity at around 5 years of age. The fish are caught young and are either sold prematurely or ranched, a method in which the wild fish are kept and fattened until ready to sell. This is extremely problematic as the fish are unable to spawn and regenerate their depleting populations. Their slow growth makes the bluefin tuna vulnerable to exploitation. What can be done to save this majestic fish? Although Japan is the biggest consumer of bluefin tuna, they are also leading the conservative method of farming. 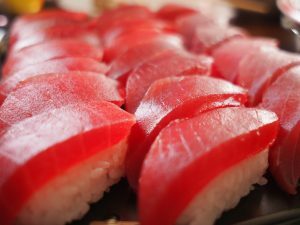 Kinki University has succeeded in breeding farm-raised bluefin tuna, raising the fish from egg until it is ready to harvest. This is a laborious process due to the length of time it takes tuna to mature. Tuna can metabolise up to 15 times their body weight and as they eat live fish such as mackerel and squid, this makes raising the tuna quite an expensive task. Although not an easy process, the amount of farmed tuna will have to increase in order to support the current fishing rates. Strict regulations should be enforced on the age of capture of wild tuna to ensure that these fish are of a mature age when caught. There are certain conservation regulations in place but conservation efforts will need to drastically improve if we are to stop the exploitation of this vulnerable species. Previous Previous post: Why do We Sweat? Next Next post: Why Classify ? Sad but true. This problems also brings negative impacts on the marine ecosystem and environment .Nice sharing.